Tragedy struck the sports world yet again this weekend, as another fan fell to his death while leaving a football stadium in California. The man, whose name has not yet been released, fell on Sunday afternoon from the elevated Jamestown walkway that travels around Candlestick Park, where the San Francisco 49ers and Green Bay Packers were playing. Off-duty paramedics and police offers tried to help the man, but the man had already passed. Initial eyewitness reports indicated that the man was intoxicated at the time of the incident, though investigators are still trying to determine what caused the man to fall. Fan safety has been a very important topic in professional sports, as fan injuries have become more and more prevalent at sports stadiums. Also this weekend, some rowdy fans from the University of Maryland were injured after a section of bleachers collapsed at Ludwig Field during a soccer match against Duke. Last month a 30-year old Atlanta Braves fan died during a baseball game at Turner Field when he fell nearly 70 feet from the upper viewing deck. When incidents like this occur, the first questions people usually ask are “Why did this happen?” and “Who is responsible?” People are also concerned about how the incident could have been prevented and how future similar incidents could be prevented. Referring back to an earlier blog we posted about fan injuries in stadiums, there are several things that can explain the legal responsibility a stadium owner has to a fan that has been injured while at the vicinity. Owners and managing companies of these large stadiums are fully aware of the types of risks posed to individuals who visit their establishments, and often tickets to sporting events or concerts are printed with a disclaimer and assumption of potential risk statement. These statements essentially mean that by purchasing the ticket, the guest understands the risk for injury and assumes responsibility should he or she be injured at the stadium. The statements also relieve the stadium’s owners or managers from assuming legal liability for the injured person. 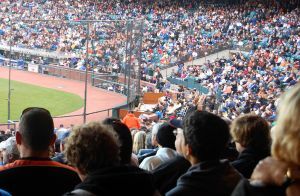 In addition to the disclaimer on tickets, venues that regularly host sporting events are outfitted with protective equipment and safety measures to prevent spectator injury. But while ticket disclaimers as well as these preventative measures serve to defend venues from legal responsibility should someone be seriously injured, and courts typically disregard personal injury claims because of that rule, there are some exceptions. Personal injury and negligence claims may be filed if an injured party can prove that the owners of the sports stadium or entertainment venue did not take adequate measures to keep them safe. An example of a premises liability situation that does not fall under the “assumption of risk” disclaimer could include a faulty railing or broken steps that cause a fan to fall and become injured because of faulty property maintenance. In the above cases, investigators will look to see whether it was a preventative safety measure that was not in effect that could have caused the incident.. If you or a loved one was injured while attending an event at an arena or sports stadium, call one of the experienced Boston Premises Liability Attorneys at the law offices of Altman & Altman. Upon thorough review of your case, our lawyers can determine whether you have grounds to file a claim against an owner of a venue for negligence and failing to protect your safety. Our team of seasoned attorneys has nearly 50 years of experience handling premises liability cases, and we have successfully recovered millions in compensation for our clients. All initial consultations are free and our lawyers are available around the clock to answer any questions you may have regarding your case.